When Cinemanovels opens, Grace (Lauren Lee Smith) is dealing with the loss of her father, an esteemed Quebecois filmmaker that left her and her mother for his leading actress while Grace was still quite young. While tying up loose ends, she agrees to host a retrospective of her father's work at a local theatre, hoping, in part, to get to know him through the many films of his that, up to this point, she hasn't seen. Grace, as a character, is extremely unconventional and even a tad enigmatic. 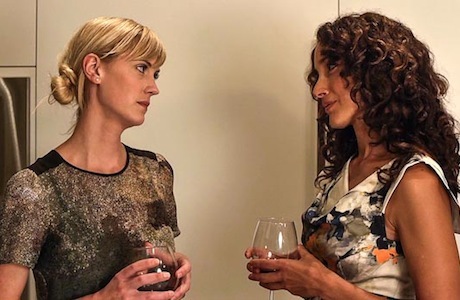 She's socially limited, confiding only in her more conventional, well-adjusted friend Clem (Jennifer Beals) and has little emotional interest in her simplistic but well-intentioned husband Ben (Ben Cotton). She puts on the facade that she wants to have children with Ben but replaces his sperm sample with soap at a fertility clinic and seems genuinely indifferent to his tendency to lie to her about going for a run when he's really going to a bar. She's as uncertain about what she wants as she is reluctant to question or defy the status quo, which is why her attempts to curate an event are limited mostly to watching movies on her couch and avoiding making any clear decisions. Of course, that she's a merely a passive spectator in life, waiting for others to do the deciding isn't an accident. Once she starts watching her father's movies, all of which are about love triangles, infidelity and broken relationships, she starts to emulate the behaviours of the characters, making uncharacteristic advances towards film editor neighbour Adam (Kett Turton). Her tenuous stabs at establishing an identity as a projection of her father's auteur vision speaks to the sense of male rejection introduced into her lexicon at a developing stage. As presented by Terry Miles and performed with idiosyncratic whimsy by Lauren Lee Smith, this floundering sense of self has a broad sitcom sensibility, more goofy than it is cathartic or comprehensive. It doesn't help that the composition and aesthetic sensibilities of Cinemanovels--despite being consistently washed out and overlit—are somewhat desultory and cheap. This is exacerbated by Miles' decision to film scenes from the works of a supposed "master" of Canadian cinema that look a tad like something Tinto Brass might direct. Still, somewhere amidst the awkward stabs at placating comedy—one such trajectory involves Adam's surly roommate (Katherine Isabelle) refusing to adhere to social niceties—there is some curious commentary about an abandoned child's persisting attempts to find validation. Here, the conceit of cinema, or "cinemanovels" as Grace's deceased father would refer to them, allows her to exaggerate and perform the characteristics and attributes necessary to earn the affections of a man incapable of expressing his feelings. But since they're so broad and often campy, there's not a great deal of human truth or cinematic appeal to mine from these primarily superficial, sexual stabs at shaking up a routine.